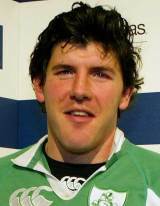 Leinster and Ireland wing Shane Horgan has terrorised defences from both centre and wing since his provincial debut in 1998. Standing at 6 ft 4 in tall and nearly 230lbs, Horgan's pace and power set him apart from the majority of northern hemisphere wingers. Horgan's senior Ireland debut came in 2000 against Scotland in the Six Nations, and made an immediate impact in crossing for a try. His coring form continued as he scored a brace of tries against Italy before adding another against Wales during the tournament. Alongside Ronan O'Gara, Brian O'Driscoll and Gordon D'Arcy, Horgan formed part of one of the most potent back-lines in world rugby, helping Ireland to three Triple Crowns in four years between 2004 and 2007. Horgan was selected for the British and Irish Lions tour to New Zealand in 2005, winning four Test caps, firstly against Argentina in Cardiff and three from the bench as the Lions were routed by the All Blacks. Horgan scored the winning try against England in the 2006 Six Nations to secure the Triple Crown, before being selected for Ireland's disappointing 2007 World Cup squad. Horgan started matches against Georgia, France and Argentina, but was powerless to stop Ireland crashing out at the group stages. Horgan was again involved in Ireland's underwhelming 2008 Six Nations, but was confined to a single substitute appearance for new Ireland coach Declan Kidney against Canada in their 2008 autumn internationals.